Citroen reveals Wild Rubis SUV concept | What Car? 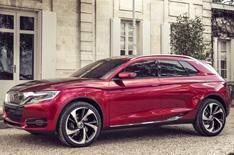 Citroen has unveiled the DS Wild Rubis concept SUV ahead of the Shanghai motor show this month. If it gets the green light to move beyond concept stage, the company intends to give the DS SUV a plug-in hybrid drivetrain. The DS Wild Rubis features a low roofline and is about the same size as an Audi Q5. The concept sits on 21-inch wheels and has chrome accents along the roof and side, as well as around the twin exhausts and grille. The front is inspired by the previous Numero 9 concept, and features full-LED headlights. The rear and sides of the car are deeply sculpted, and the colour of the concepts red paint changes with the intensity of light.